May Animo Ka Pa Ba? 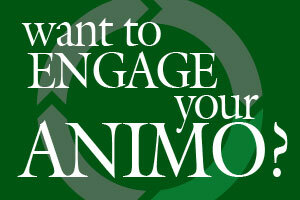 Calling all DLSU Students, DLSU Faculty, and DLSAA Lifetime Members! Join us on our second DLSAA CEO Lecture Series this June 27, 2018, Wednesday, 1130am-100pm at The Verdure 5/F Henry Sy Sr. Hall. Come and learn how our guest speaker, Mr. Manuel "Manny" Tordesillas, climbed his way up to become one of our prominent LaSallian alumni. See you there! 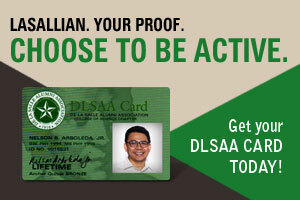 Calling all DLSU Students, DLSU Faculty, and DLSAA Lifetime Members! Join us on our first DLSAA CEO Lecture Series this May 28, 2018. Come and learn how our guest speaker, Engr. Lubin B. Nepomuceno, climbed his way up to become one of our prominent LaSallian alumni. The nomination period for the 2019 DLSAA One La Salle Night of Excellence is EXTENDED. The new deadline for the Exemplary Awards Nominations is on Sept 15 and for the Sports Awards Nominations is on Sept 30. The De La Salle Alumni Association (DLSAA) held the first DLSAA Special General Assembly (SGA) last March 3, 2018 (Saturday), 3:00 PM, at A1103, Br. Andrew Gonzales Building, De La Salle University. The ‘38 special’ DLSU Alumni Homecoming is more special this year. DLSU Animo Labs Foundation Incorporated is DLSU's preferred technology business incubator. 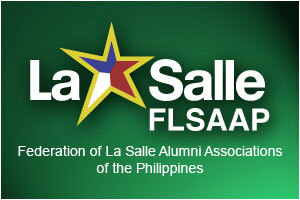 In cooperation with the De La Salle Alumni Association, the De La Salle College High School Class ’68 Last of Mighties successfully held the 15th Br. Benedict Golf Cup (BBGC) last February 22, 2018 at the Valley Golf and Country Club, Antipolo, Rizal. 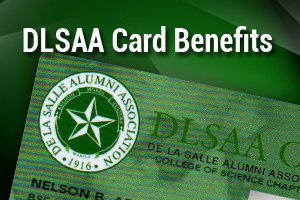 De La Salle Alumni Association (DLSAA) and Petron Corporation forged a partnership through the DLSAA – Petron Value Card (PVC). DLSAA President Dr. Nelson Arboleda, Jr., DLSAA Executive Director Dr. Joaquin Moreno, Petron Corp. General Manager Engr. Lubin Nepomuceno, and Petron National Sales Manager - Cards Mr. Gregorio Abada signed the memorandum of agreement for the DLSAA - Petron Value Card last January 24 at the Manila Golf and Country Club. De La Salle Alumni Association Northern California Chapter recently had their donations distributed to the De La Salle-College of St. Benilde School of Deaf Education and Applied Studies, the Bahay Pag-asa Dasmarinas, the Jaime Hilario Integrated School-La Salle, and to the DLSAA Scholarship Fund.